There are some redeeming elements. While the cinematography, editing, and music aren't flashy (nor should they be), the acting is terrific. Nicole Kidman clearly pours herself completely into this role and does some fine work. Aaron Eckhart runs a full gamut of human emotions; his character (spoiler), though tempted and lonely, stands by his wife and marital vows. The film will give viewers greater empathy and understanding of the struggles of those who've lost a child. There are some nice messages about forgiveness and reaching out to those who have hurt us. But it misses opportunities to show how faith and healthy relationships can provide hope and comfort after tragedy. Instead, religion is denigrated (Kidman blasts it, only later to find relief in psuedo-science) and the film ends just as the marriage is showing minor signs of life; another ten minutes to show these characters really starting love each other again would have made this a story better told. 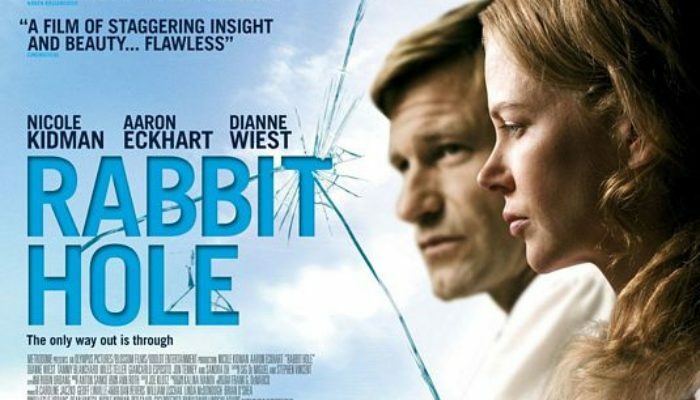 CONTENT OVERVIEW: Rabbit Hole is rated PG-13. It contains one f-word and a handful of moderate profanities. A woman curses God, comparing him to an abusive husband/father. A man and woman smoke marijuana, though this is shown to have negative consequences. The film is thematically intense, dealing with grief, guilt, and the death of a child. MESSAGES TO DISCUSS: Grief must be passed through; we hurt because we love, and the only way to live without pain is to live without love. Husbands are to love and cleave unto their wives and none else. Peace comes through forgiveness.